First air date on FOX July 1, 2007, episode 5 of myrtle beach TV included hosts John Zilinsky, Bill Norman, Cindy Collins, Marcia Lynn Walker, and Warren Walker. Guests on the show included Pauline Levesque, CEO, Myrtle Beach area Hospitality Association, Jay Rowe, Professor of Hospitality and Tourism, Horry Georgetown Technical College, Gerry Ives, Park Manager, Myrtle Beach State Park, and Charlene Lynam, Events Director, North Myrtle Beach Chamber of Commerce. And viewers were treated to musicians well-known on the Grand Strand, the Tim Clark Band, in our local musicians segment. 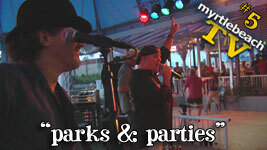 Watch the WM HD version of episode 5, in its correct aspect ratio, "parks & parties".